The Oakland restaurant's selection of vegan eats is notably strong. 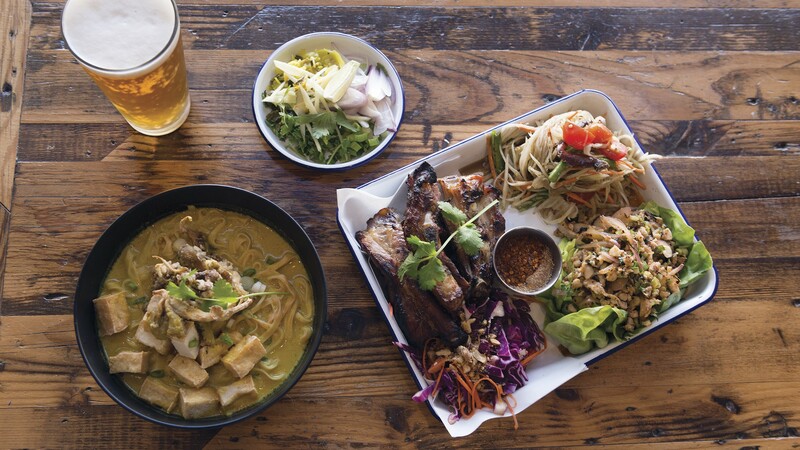 Personal party platters (right) let you try three dishes for $20, but the kao soi also tempts. From its industrial-chic interior to its prime location in Temescal and the ampersand in its name, Bird & Buffalo might tempt you to write it off as a watered-down, hipster Thai restaurant. But that would be unfortunate, because Bird & Buffalo offers a unique experience in the East Bay's landscape of Thai restaurants. It's not upscale, but it's pricier than your typical, Americanized Thai spot. At the same time, it's Americanized in different ways — in its aesthetics, focus on dietary restrictions, and solid craft beer list, for example. And the menu, while full of familiar dishes, doesn't read quite like any other Thai restaurant I've visited. There's no pad Thai. No basil fried rice. No suspiciously green curry. Instead, the focus is on simple, rustic meals you're more likely to find at someone's home in the Thai countryside than at a sit-down restaurant in Bangkok. Owner Todd Sirimongkolvit calls it Thai soul food. Sirimongkolvit is no stranger to the Bay Area food scene. His team also runs a trio of higher-end Thai restaurants: Soi 4 Bangkok in Rockridge and Basil Thai and Basil Canteen in San Francisco. 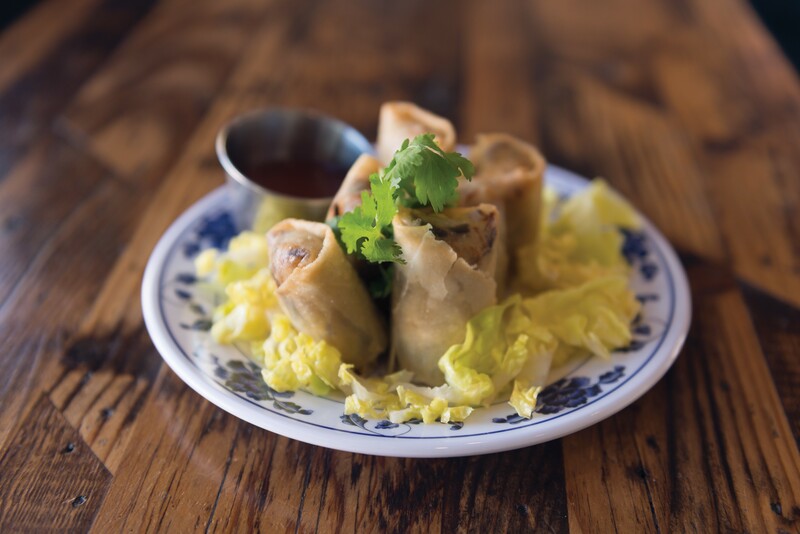 Bird & Buffalo, which opened in January, is his most casual, laid-back restaurant yet, and it fills a previously unoccupied niche for Thai food in the neighborhood. The biggest section of the menu is labeled "Curry Stand." It's loosely inspired by roadside curry stands in Thailand, where you point to a premade curry and it's poured directly over rice. There is no such pointing at Bird & Buffalo, and not every item is curry, but you get the idea: a complete meal served in one bowl. My favorite was the gai gra prao kai dao, minced chicken stir-fried with Thai basil, chili, and garlic over rice — a satisfying, balanced bowl of comfort. The saucy chicken was remarkably aromatic and assertive with basil. The fried egg on top featured a precarious yolk and crispy, latticed edges. And, as with the other rice bowls, it also came with perfectly blistered, garlicky green beans that retained their color and snap. The actual curries I tried, however, revealed more inconsistencies. The mussamun neur's stewed beef short ribs were a mixed bag: some cubes were fork-tender while others were tough and dry. The peanut-laced curry tasted thin, watery, and mild at first, although the spice built slowly and deceptively — my running nose took me by surprise shortly before I finished lunch. I usually adore kao soi, the Chiang Mai-style yellow curry noodle soup, so I felt initially uncertain about Bird & Buffalo's explicitly non-traditional, vegan version. Instead of combining boiled and fried egg noodles, the restaurant uses wide flour noodles, which do a good job of soaking up the delicious, coconut-based curry but offer less chew. In place of crispy noodles, the chefs sub in fried oyster mushrooms — a fun riff on an important textural counterpoint, but unfortunately, these shrooms were totally bland. Thus, a dilemma: dunking the mushrooms in the curry meant gained flavor but lost crunch. Still, it's hard to complain too much about such a tasty vegan version of kao soi, which is practically unheard of. It even came with all the fixings, including pungent pickled mustard greens. That said, I had mixed feelings throughout my meals at Bird & Buffalo. For every dish that excited me, there was a small let-down to follow. I adored the grilled lamb chops — lamb chops, at a Thai restaurant! — which were charred to a juicy medium-rare and paired with a zingy chili sauce. The grilled half chicken, however, was slightly less successful. The dark meat's stretchy, blackened skin gave way to tender bites, but the breast meat was dry. I was thrilled to see pork jowl larb on the menu but immediately frowned when it arrived cutely tucked into butter lettuce cups — a touch that struck me as unnecessary and silly. Cut into long strips, the grilled pork had a fun, chewy texture but was outweighed by an overabundance of shallots. (Bird & Buffalo doesn't serve any raw meat larb.) The balance between tang, salt, and fresh herbs was on point, but I longed for more heat. Similarly, the Lao-style papaya salad was infused with oceanic flavor from shrimp and crab paste, but it lacked its characteristic fiery punch. With ten beers on tap, Bird & Buffalo also offers a few snacky items. I enjoyed the herbaceous, slightly spicy Lao-style pork sausage as well as the nham prik noom, a chunky, roasted green chili dip. It came with an attractive spread of grilled vegetables and, again, offered an appreciated and flavor-packed vegan option. On the side, I ordered roti — perfectly flaky and stretchy, but drowning in oil. Personal party trays, a leftover deal from Oakland Restaurant Week, offer an easy way to try multiple dishes at once. Essentially, it's a build-your-own sampler of three items for $20: one grilled meat, one papaya salad, and one larb. It's a lot of food — probably too much for one person. In a sense, it's another Americanization. Thai meals are usually eaten family style while American meals are consumed individually — and, as with this party tray, in much larger portions. Crispy vegetable spring rolls are one of several vegan options.